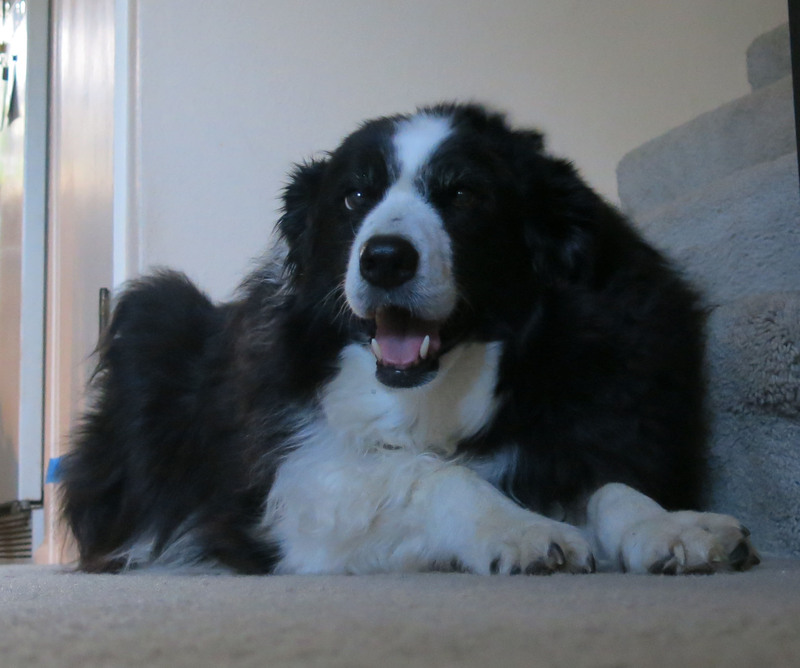 Hello everyone; yes, once again it is I, Chess the purebred border collie, filling in for the guy I live with, and here to bring you the latest, most-up-to-date news from our garden. You may remember me from such up-to-date posts as “The Expired Chicken” and “Grapevine Down”, among so many, many others. Here I am in a characteristic pose. This is my summertime pose, now, I guess. I’ve been sick, but feeling much better today, thank you; of course I have a live-in nurse, and antibiotics to take. The guy I live with says I “got into something” on my walk, which I do almost every year, so we’re kind of used to this, but still, it was such a beautiful day yesterday that I was sad, because I didn’t feel so well. 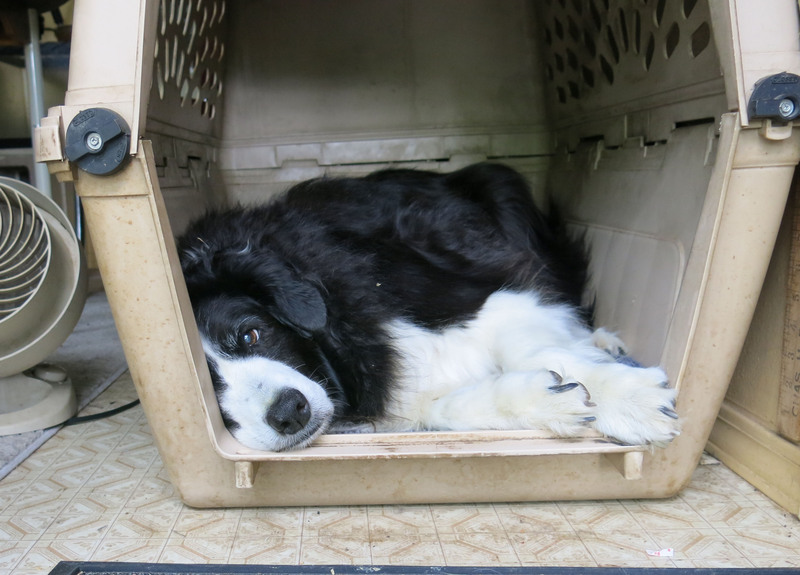 Today wasn’t so beautiful, though it started out like it would be, and then the clouds rolled in, and it got all dark and thundering, like it has so many times this summer, and I had to retreat to my fort, as you see me here. It got nicer, later. For all the darkness and thunder we’ve had this month (not to say anything of July, June, or May), we’ve had less than a half an inch of rain so far, so the guy I live with says if it isn’t going to rain, it should be sunny. I think I agree. The guy I live with has been obsessing on cyclamen, a little, because he tends to obsess on little things when going out into the garden isn’t much fun. Cyclamen hederifolium again. Cyclamen fatrense again (or C. purpurascens, if you insist). The one on the bottom sowed itself. Or I should say ants sowed it. Another seedling, maybe of Cyclamen cilicium. Heuchera leaves on the right. 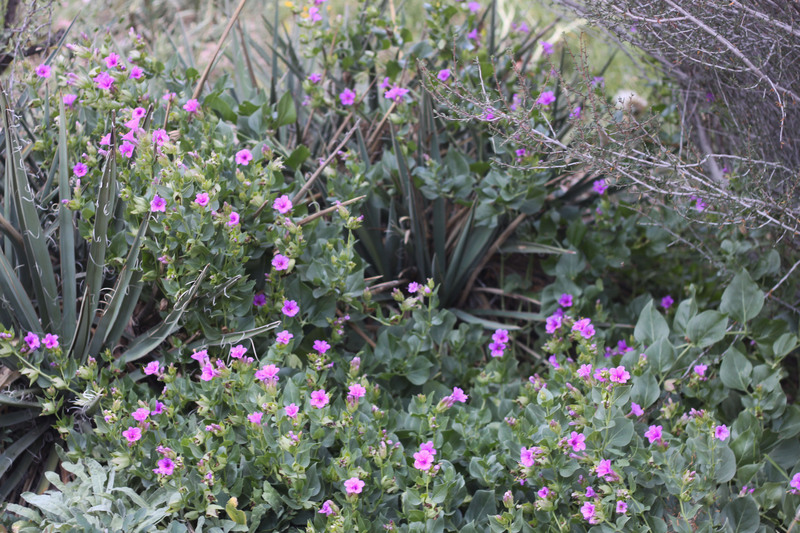 The four o’clock, Mirabilis multiflora, is looking pretty good. Climbing into Yucca baccata. 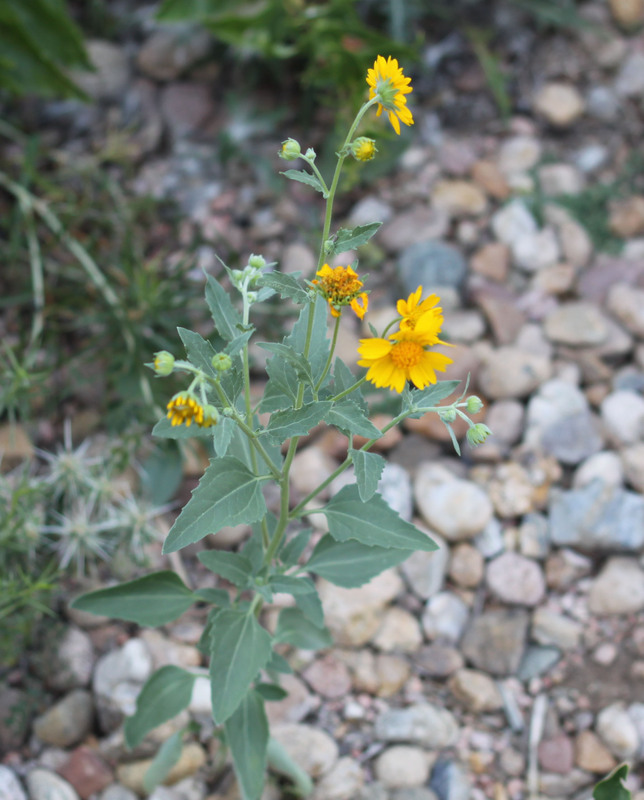 The cowpen daisy, Verbesina encelioides. The guy I live with is extremely happy that these decided to live in the front yard. And, for years, the guy I live with has had issues with finding a true perennial datura (Datura wrightii; not the others), but seedlings have never lived long. He doesn’t know why. The other day he noticed a datura in the front yard, and it’s decided to bloom. It’s probably not wrightii, but who cares? (I don’t, anyway.) It really is a little purpley on the end there. Oh, okay, I need to show you this. I think this is really dumb, but the guy I live with insisted I show you how to make your own portable drip irrigation device. 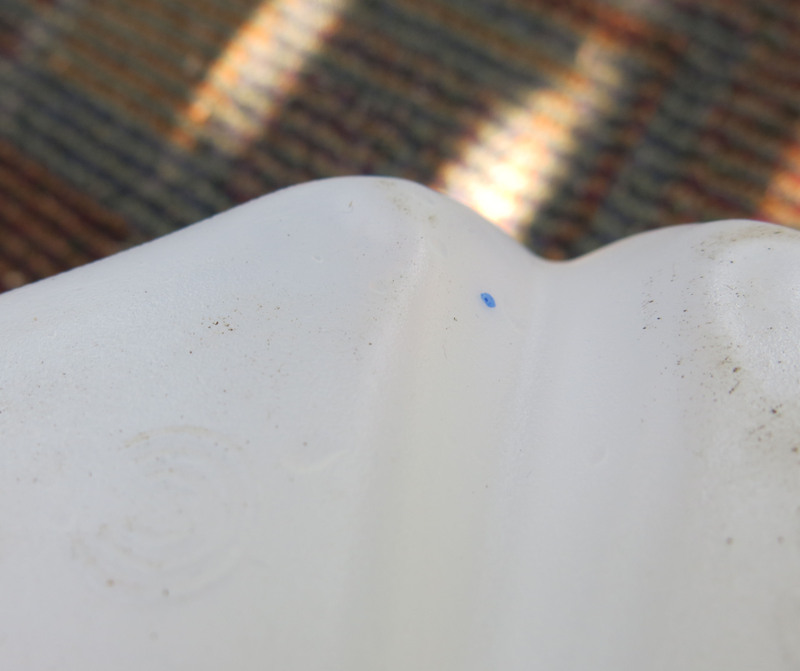 You get an empty plastic jug, and put a hole in it, with a nail (pin is too small; the plastic will heat in the sun and seal the hole), on the bottom, in the area indicated with the blue dot. Then, putting your finger over the hole (the guy I live with said to say this, because when he first invented this, well, guess what happened), you fill up the jug, and carry it out to the plant you want to drip water on. Well, that’s all the news for today. I imagine I’ll be posting more cyclamen pictures, and hopefully the twenty or so species of autumn-blooming crocus will start to appear, and there are asters and other things to come. I can hardly wait, because it means cooler weather, and maybe an end to the thunder, eventually. 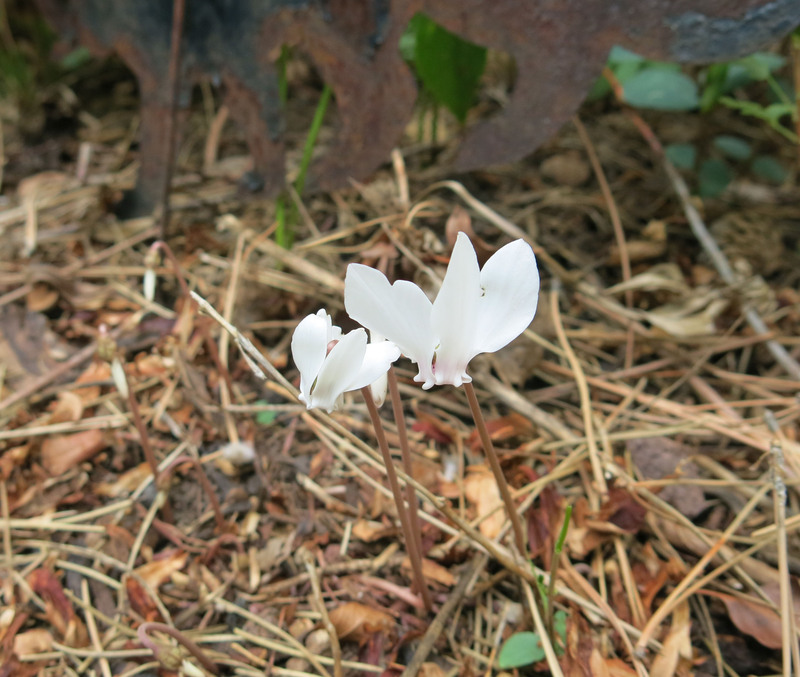 This entry was posted in Uncategorized and tagged cyclamen hederifolium, mirabilis multiflora. Bookmark the permalink. Thanks; I’m feeling much better thanks to the antibiotics. Oh, speaking of things of that nature, the guy I live with noticed some poop on my walk that looked suspicious, and now it’s disintegrated into nothing but chokecherry pits. There were chokecherries on our walk, but now they’re all eaten. He says we might have a bear in the neighborhood, so I’m going to have to be extra vigilant. We heard a strange noise in the opposite corner of the garden (the “employees only section”) last night, but pretended not to have heard it, which was probably the wisest course of action. The four o’clock really isn’t invasive but it does seed around, occasionally. Called Colorado four o’clock but native to California, too. Weber, in Colorado Flora Western Slope says there’s one that’s scented of old garden roses, blooming in the early morning. Ants are very important to getting cyclamen (and crocuses, and snowdrops) to seed around. 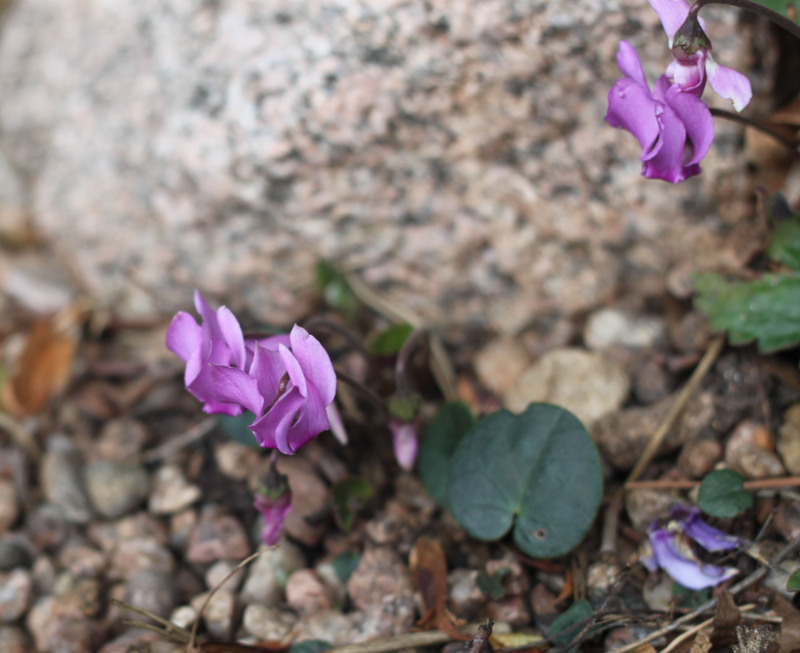 The seeds have a sticky-sweet coating, the elaiosome, which they like, and carry off, and then cyclamen appear all over the place. The process of seed distribution by ants is called myrmecochory. Cyclamen are a really big deal around here, but of course, when they’re in peak bloom, later this year, the guy I live with will just say “Oh, the cyclamen”, as though it’s no big deal at all. 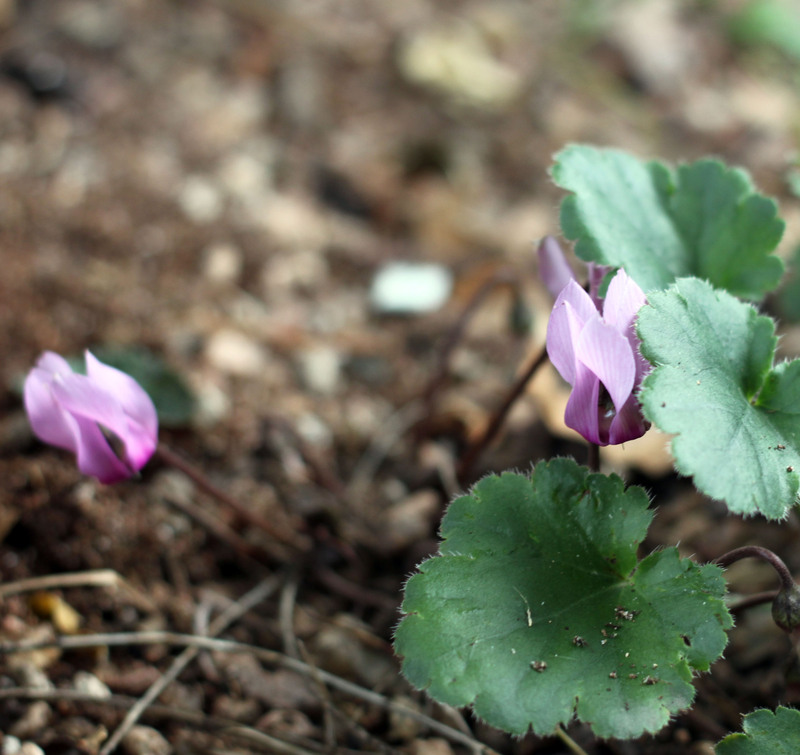 Sometimes, there are flowers in January, and he’ll just say something like, “Oh, there’s a cyclamen in flower”. I’m sorry you aren’t feeling well. Ted the cat who lives here has also been under the weather. It’s a *itch to give a pill to cat. On top of that we had a really unpleasant earthquake in the middle of the night. Ted was stoic, but Doobie fled to the back yard. All of us here would prefer lightening and thunder to a 6.0 quake. What kind of cheery remark do Californians say to each other after a quake? I feel like I want to say “Congratulations” for getting thru it, but that doesn’t sound right. Glad that all your herd made it, human and critter. Oh dear Chess, why do dogs eat EVERYTHING? Even my decrepit cocker spaniel still licks stuff off the sidewalk (LICKS) and I would think she’d know better, especially since I made her her favorite broccoli casserole for lunch. When my vet told me that I’d need to give her eye drops 3 times a day I thought I was in for a terrible, awful time but that’s because I’ve always had cats. Turns out that it is incredibly easy to give a dog eye drops. And then you get to kiss her on her nose which believe me, a cat would never ever let you do after such a harrowing experience with an eye dropper. Could be that you know wrightii from Brazil, though this Wright was an American botanist, who took part in the United States and Mexican Boundary Survey in 1851. Datura in “jimsonweed”, too, but a different species. Dogs eat everything because, well, um, because it’s there. My grandpa Flurry ate everything, including lettuce (ptui), and extra-hot hot sauce off of dinner plates. The guy I live with ate a Destroying Angel mushroom when he was two, so he has nothing to say about the matter. I think we probably would too. Earthquakes are very scary. The guy I live with had a cat that had to have pills. He would sneak up on the cat, squeeze its lips, and toss in the pill. Something like that. He got scratched a lot. I moved from Seattle to NYC in 1994 after the” year without a summer” . No guarantee that the weather will be better. I’m glad that you are feeling better. I have a diabetic cat who takes his twice daily insulin shots without protest. However, my favorite cat, who died 3 years ago, had to get cream rubbed on his ears for hyperthyroidism and that was tough. You seem to be a mellow dog. I am mellow, aren’t I? The guy I live with says it’s because of the phenobarbital…… (Incidentally he found my new med, which I’m switching to after the course of antibiotics is done, for one third the price, at Costco. He’d never been there before, and said he could get 500 steaks if he wanted to, and if he ate steak. I would eat steak.) No, the weather is just weird everywhere. People have been saying that “extreme weather” is becoming more common. The guy I live with suggests that this could mean “extremely nice” for a very long time. Little things mean a lot, dear Chess. 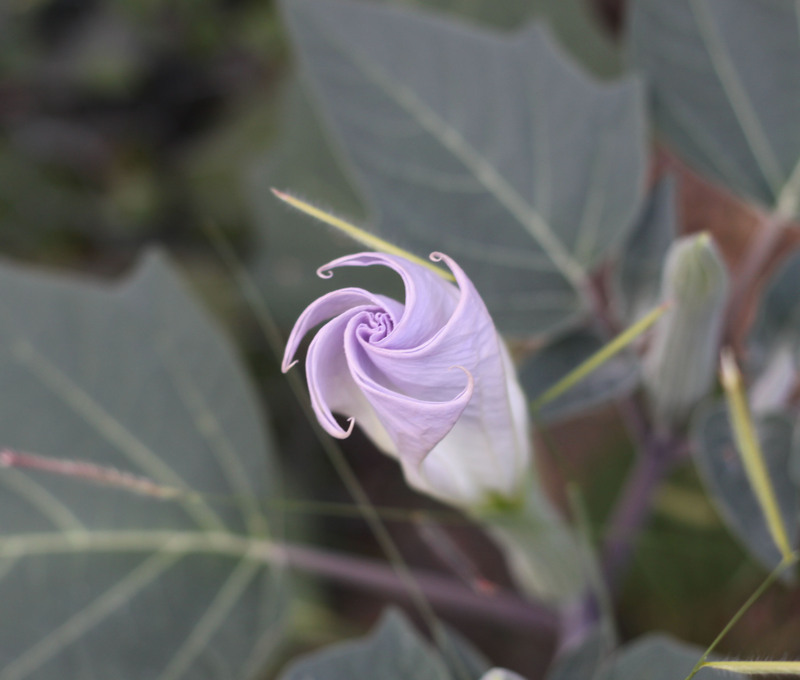 The datura is so very lovely, you can see it dancing. It looks like one of your mommy’s paintings. Thanks; we have no idea how it got there. One time the guy I live with got one with purple tips from Timberline, but that was a really long time ago. It’s a mystery. Glad to read in comments that you are feeling better. Love all your little cyclamens. Thanks; feeling much better indeed. Though there was a scary thunderstorm this afternoon, and I was afraid I was going to get hit by lightning (a strike very close to the house), but it brought rain. The guy I live with calculated that we have had around 275 (two hundred and seventy-five) thunderstorms pass over or near our little neighborhood since the middle of May. It’s been a rough summer for me. Then later in the evening it rained for over an hour, without thundering. 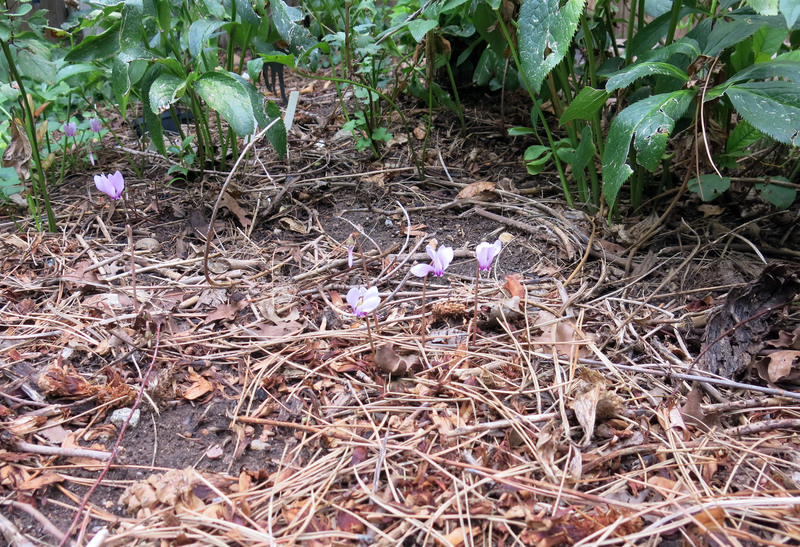 The newly-planted cyclamen (about twenty of them) will like all the rain, for sure. (There are hundreds of plants in the garden already, but someone decided we needed more.) In our climate, they need to be planted about now, so they can get their roots into the soil. Otherwise they heave, and rodents discover them. I used the work humid in a sentence the other day when talking weather with preschoolers! I have never seen the hillside native grasses so green this time of year, and certainly I have never had hay fever this late into the season – Chess, do you bring grass pollen inside like Maggie does? I do, but the guy I live with isn’t allergic to anything. Except the smell of our neighbor’s laundry detergent, fabric softener, air freshener, etc. (The guy I live with remarked the other day on how so many people reek of laundry products, though they probably don’t even realize it.) I’m getting carried away. Lots of rain yesterday (about four tenths of an inch). Later in the evening, we even had rain without thunder. Everything looks so perky. It was such a beautiful day today, too; we’d forgotten what they were like.